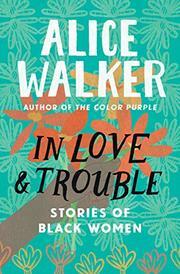 A collection of stories about black women in love and trouble which amounts to the same thing. They've basically got the light touch of her poems and the same slow fondling description as her novel, The Third Life of Grange Copeland. And they deal with transitions in much the same way -- by letting things reveal themselves. The stories are just a little thin, though, as Ms. Walker knows because you see her reacting -- one finally erupts in frustration with the heroine trying to behead her husband with a power saw. You also see her working out possibilities. She has several interesting successes -- horrible suspense in "Strong Horse Tea," integrated violence in "Her Sweet Jerome," latent allegory (the phrase is tog heavy, the point rounds on you ironically) in "The Welcome Table." One or two don't make it off the ground but they look like things she just tried for the sake of trying -- like "The Diary of an African Nun," for god's sake. But the real stuff is nice as ever.